Kimberley Coastal Camp is a unique wilderness retreat situated in Admiralty Gulf on the far north Kimberley Coast. Because Kimberley Coastal Camp is accessible only by air or sea, we can promise you a stress and crowd free escape. Kimberley Coastal Camp combines all the joys of isolation with luxury camping at its best. 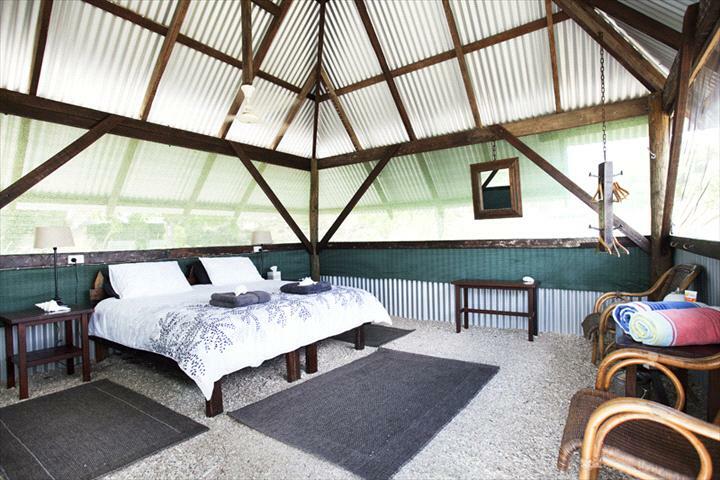 Sleep in flyscreened comfort in your spacious gazebo-style room with fans and panoramic views. Gourmet meals are provided with freshly sourced ingredients, passion and flair. Everything is homemade on the premises from the breads and pastries, to the jams and pickles. Special dietary needs are happily catered for. Fish has never been this fresh, this delicious. Rocky Terry, your host and fishing guide, has the expert knowledge which can only be gained from years of experience in Admiralty Gulf. Throw in a line form Barra Rock, right in front of camp, or troll for mackeral or any other number of warm water species. Anchor off a reef or island and catch your lunch, or venture up the mangrove lined creeks for a catch of delicious mud crabs. From the high black basalt cliffs to the pristine white shell beaches and the sandstone country with its rives and caves - experience this land of contrast. Go beachcoming on a deserted island, sit by a freshwater billabong or simply laze the day away by the pool. Come with us into the untouched wilderness and search for rock art, the origins of which are lost in time. Kimberley Coastal Camp is at the centre of one of the worlds largest and most fascinating repositories of indigenous rock art, including the elegant Bradshaws or Gwion Gwion figures. All these activities are fully-guided and included in the price of your package. Rates for 2009 are $740per person per 24 hours, including accommodation, all meals and fully guided activities. Contact us to discuss a tailormade package with light aircraft and helicopter transfers from Darwin, Kununurra, Broome or Mitchell Plateau. Finalist in the 2005/06 Australias North West Tourism Awards. Rates are $990 per person per 24 hours including accommodation, gourmet meals and fully guided activities. Packages including air transfers can be arranged from Broome, Kununurra, Darwin or Mitchell Plateau. Our unique gazebo style rooms can be configured for 2 single beds or a king double bed. A child can share with parents if required. Every room has its own views, large celiing fans, flyscreened walls and 24 hour power. Breakfast and all other meals are included in the tariff - as are your choice of fully guided activities. 60 days or more prior to arrival: full refund less $550 per person; 30-60 days prior to arrival 30% penalty; 30 days or less prior to arrival no refund. Kimberley Coastal Camp operates in remote and rugged locations. Guests must be in good health and have a reasonable degree of fitness. Although all precautions will be taken Kimberley Coastal Camp will accpet no responsibility for personal injury loss or damage to personal effects or expenses incurred as a result of any delay cancellation or alteration of an service due to cicumstances beyound our control. We strongly recommend that all guests obtain travel insurance including a cancellation policy.